I’ve been on hiatus from this blog since I began curating the blog for GrantCraft. I will try to at least cross-post my personally-authored posts here and revive my own writing as time permits! 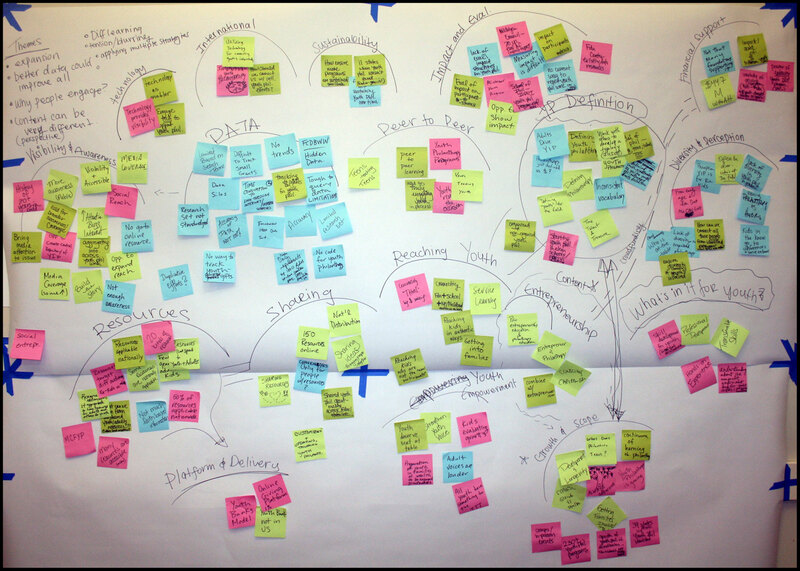 What: Human-Centered Design (HCD) puts humans at the center of a creative and critical thinking process that promotes rapid generation of ideas, helps organize and process lots of information, guides group input, and ultimately helps make better decisions. It relies on our human capacity for empathy, as well as our ability to be intuitive, to recognize patterns, to construct ideas that are emotionally meaningful as well as functional. Who: You! HCD helps to harness the unique perspectives and ideas that we can find difficult to get our arms around. It’s inclusive, allowing all voices to be heard including introverts and extroverts, senior program officers and communications associates, the tech-savvy and people who prefer pen and paper only. Where: In meetings, at your desk, at strategic planning sessions, in the field. Make sure you’re in a place that has a flat surface like a wall or a table and some post-its, markers, and sharpies. When: HCD can be used for observing people, seeing how they interact with a product or service, understanding challenges and opportunities, and testing ideas in real-time. In short, there are opportunities at any point in a project to use design thinking. Why: HCD approaches problems and solutions more thoroughly and thoughtfully by allowing more ideas and diverse perspectives to surface. It focuses on action instead of just thinking, makes abstract ideas more tangible, allows for uncertainty and challenges, and better integrates the human experience. It supports thinking outside the box and provides anonymity of ideas, making it easier to iterate and ideate as a group without bias or confrontation. Plus, it’s fun and keeps things interesting! Plan early and with a partner. Clearly explain the activity so people can fully participate. As the activity progresses, you’ll also want to digitally record outcomes (take pictures!) and create a safe space by being mindful of different personalities and perspectives. The Luma Institute provides terrific resources on HCD, including books, planning materials, and activity templates. I can personally vouch for their terrific two-day trainings, too. Beth Kanter’s blog, especially her post summarizing a day-long meeting in which we both participated at a foundation. ← Pretty neat axe. That’s right, an axe.